This is a simple and quick layout. When you scrap all of your pictures it gets difficult to have masterpieces of all of them (not that my layouts are masterpieces), but some are better than others. Besides I like to have different styles of layouts, even though I have my preferences when it comes to style I think it’s nice to have variety when turning the pages of my albums. Because I don’t want to share my family photos I covered them on paint (the program). 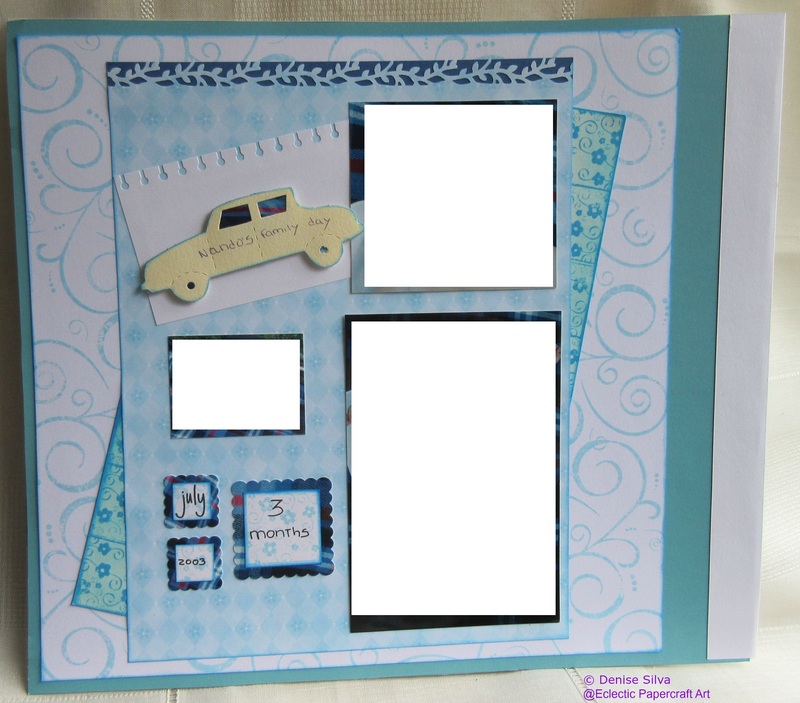 When I cut my pictures to the desired size I was left with some pieces of the patterned blanket from the picture, so I used them for the background of my “embellishments” that contain the info I want on this page rather than journaling. This entry was posted in Scrapbook and tagged Hip2be, Martha Stewart Edger Punch - Woodland Branch, Round Binding Edge Slim Line Edger Punch by EK Success, Scrapbook Layout, Swirls2Build, The Stamps of Life, Tim Holtz distress ink, TSOL. Bookmark the permalink. Gostei muito das tuas ideias para os álbuns de fotos. Aqui em Portugal não sei onde compram essas estampas e outros materiais. Já tiveste férias? Um abraço da Bombom. E’ verdade, em Portugal estes materials sao escassos e os que existem sao carissimos. As ferias este ano sao passadas por aqui mesmo… Esta um outono maravilhoso por aqui.